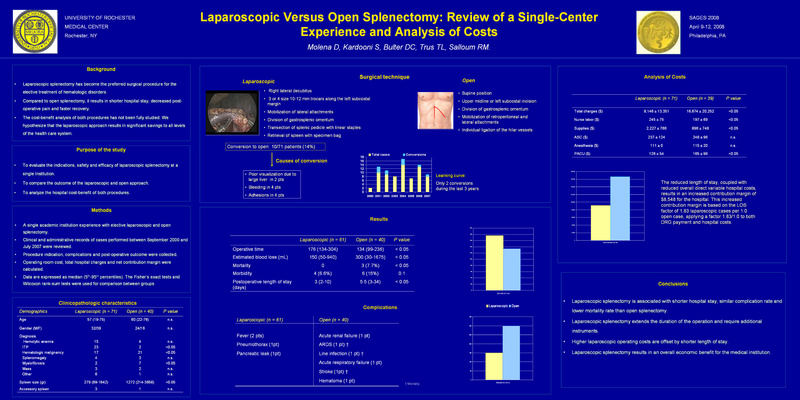 Laparoscopic versus open splenectomy: review of a single-center experience and analysis of costs. Background: Laparoscopic splenectomy (LS) has become the preferred surgical procedure for the elective treatment of hematologic disorders. Compared to open splenectomy (OS), it results in shorter hospital stay, decreased postoperative pain and faster recovery. The cost-benefit analysis of both procedures has not been fully studied. We hypothesize that LS results in significant savings to all levels of the health care system. Patients and Methods: We report a single academic institution experience with elective LS. Records (clinical and administrative) from all non trauma splenectomies performed between September 2000 and July 2007 were reviewed. Procedure indication, complications and post-operative outcome were collected. Operating room costs, total hospital charges and net contribution margin were calculated. Data are expressed as median (range 5th-95th percentile) unless otherwise specified. The Fisher’s exact tests and Wilcoxon rank-sum tests were used for comparison between groups.